Fourteen-year-old Alter High School student Lauren Shenk is making a difference! Today Lauren donated a Little Free Library to Robert F. Mays Park! A Little Free Library is a collection of books allowing anyone to stop by and pick up a book to read and leave another behind to share. First introduced in Wisconsin, the concept has turned into a worldwide book sharing movement. Lauren initiated the project to help her earn her Girl Scout Silver Award. 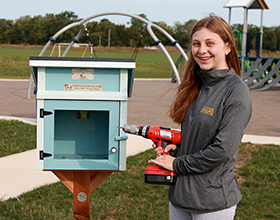 She purchased a Little Free Library kit, built and decorated it, and plans to restock it regularly until she goes to college! “I hope by doing this I can encourage children to read more and explore the world of imagination in our parks,” she said. This Saturday, September 16, Lauren will hold story times from 1 to 2:30 p.m. at the Community BIG Backyard Party at Robert F. Mays Park. She will be accepting book donations during the event to help her build up her book inventory! The Community BIG Backyard Party is a free event featuring games, activities, bounce houses, Bella Sorella Pizza and Harvest Mobile food trucks and raffle prizes. Robert F. Mays Park features a lacrosse hitting wall, a .75-mile paved multi-use trail, soccer and lacrosse practice fields, a large group shelter, and a playground with a recycled surface. Lauren’s Little Free Library is the second for the Centerville-Washington Park District. The Park District also has one at Schoolhouse Park, 1875 Nutt Road, and a third will open at Iron Horse Park, 6161 Millshire Drive, in October. You can find other Little Free Libraries in our area and all over the world by visiting www.littlefreelibrary.org.